This month's Fist and Sword program celebrates Women's History Month with an interactive panel discussion featuring multicultural female master practitioners on the challenges and benefits of the martial arts for women. The discussion will include video clips and critiques of the cinematic representations of women in film and television, and the real-life issues raised by the #MeToo and #TimesUp protests. The program opens with welcoming remarks by Warrington Hudlin, Vice Chairman of the Museum of the Moving Image and curator of the Fist and Sword martial arts film series. A reception with live music by a jazz quartet follows the discussion. Co-Moderators: Sensei Gerry Chisom a.k.a. Lady Sensei NY (Ninjitsu) and Professor Dominick Brioche (Hapkido and Jiu Jitsu). 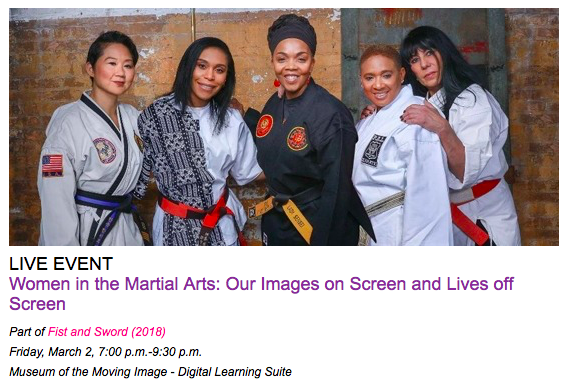 This program a collaboration between the Women's Martial Arts Network and the Fist and Sword film series at MoMI. The mission of the Women's Martial Arts Network is to advance women in the martial arts in the 21st century by creating and supporting platforms designed to educate, elevate, and empower.